Whether you’re a Fortune 500 or a newly launched startup, if you have enterprise IT equipment, you need maintenance. You have vital storage infrastructure to maintain and secure, and if it goes down, so does your business. Yes, quality maintenance contracts are essential to keeping your business up and running smoothly, but it’s a known fact that 70-80% of your IT budget is spent on maintenance and “keeping the lights on.” Logic dictates that such an expensive maintenance contract is no longer a viable option for the hybrid future—but you also face the reality that you can’t operate sustainably without one. Why Is EMC Support so Chronically Expensive? In this e-book, we are breaking down the reasons that make EMC support significantly more expensive than third-party maintenance. We are also showcasing a customer success story and how CentricsIT was able to save a leading health-tech company an average of 40-50% on EMC maintenance and support costs. 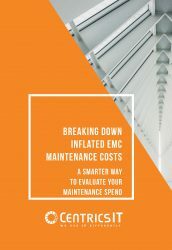 Download the e-book today to unveil the secrets formula for reducing your EMC maintenance and support costs and the steps you can take today.